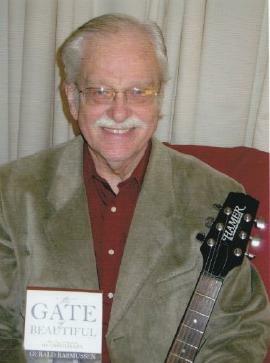 The Gate of Beautiful: Stories, Songs, and Reflections on Christian Life is a collection of writings and gospel music. Rasmussen is a keen observer of the details of every-day life. He sees the handiwork of God all around him, and shares his insights through stories and songs. Just as the gospel of Jesus Christ was filled with fishermen, farmers, carpenters and shepherds, Rasmussen writes of a weary traveler on a Greyhound Bus, honky tonk angels, hoboes, and one-eyed dogs. He has honed his stories through years of writing, and by bringing the gospel in song into nursing homes, homeless shelters, folk festivals and store-front churches. His writings have the simplicity of parables, and Christ's teachings are interwoven through his songs. The lyrics and commentary for 11 of the songs that he has written are included in the back of the book. "If you are looking for God, He's not hard to find. He is in the weed that pushes its way up through a crack in the sidewalk reminding us of the sanctity of life. He is there in the checkout counter clerk who stops for a moment to comfort an elderly woman who has just lost her husband. You can see him in the vastness of the universe He created, and hear Him in the silence of a cold mountain lake at sunrise. God is everywhere." "There are many ways people express themselves, and author Gerald Rasmussen taps into a wealth of them. "The Gate of Beautiful: Stories, Songs, and Reflections on Christian Life" is a collection of creative exercises. Christian in focus, Rasmussen's songs, stories, and essays provide much insight into man's faith, which is sure to give readers much to think about. "The Gate of the Beautiful" is quite a pick for Christian readers, highly recommended." "Jerry Rasmussen is one of those rare writers who makes it look deceptively easy to express wisdom, employing wit, homilies, and poignance to show the deeper values that lie within the everyday comedies and tragedies of life. His writing is lively, engaging, and utterly delightful." Miriam Hospodar, author of "Heaven's Banquet"
I continue writing stories, some of which will be chapters in my next book. You can read them on my blog. If you sign up as a follower, you'll be notified when I post new writings.